In local after local, auto workers voted down their union’s national deal with Chrysler, aiming to force their bargainers back to the table to do better. Some call the two-tiered contract a "bridge to nowhere." Photo: Alex Smith. This story has been updated from the original version published September 28. Auto workers have overwhelmingly voted down their union’s national deal with Chrysler, aiming to force their bargainers back to the table to do better. The United Auto Workers announced today that 65 percent voted no on the tentative agreement. The union represents 40,000 workers at Chrysler. Union officers had recommended a yes vote on the four-year pact, announced September 15. It included raises and bonuses but would maintain the two-tier system, trap people in Tier 2 who had expected to move up, and create even more tiers. Voting ended September 30. Probably the top reason workers voted no was indignation that the agreement broke the union's longstanding promise to cap the lower-paid tier at 25 percent of the workforce this fall. Since 45 percent of Chrysler workers are in Tier 2, many expected a raise to $28 an hour. With no cap, it’s only a matter of time before there’s no first tier left. Amplifying the anger were Chrysler’s high profits and the revelation that the company plans to move car production to Mexico. Facebook gave a big boost to the quickly-building momentum of the vote-no wave. In a variety of public and private Facebook groups, workers swapped contract information, local vote tallies, and photos showing ballots marked “no” and protest T-shirts. The biggest, Local 12 (Toledo Assembly Complex, Ohio) with 5,000 members, was among the last to vote—and scored the most dramatic margin, with 87 percent of production workers and 80 percent of skilled trades workers rejecting the pact. 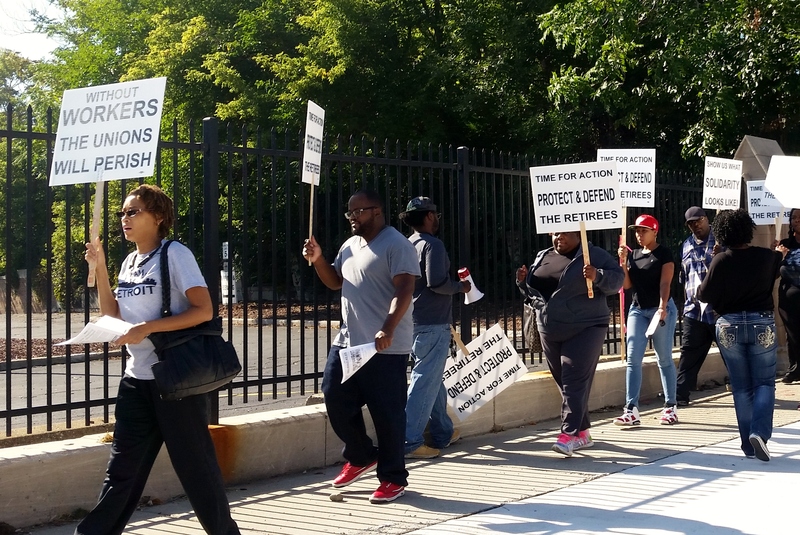 Members there had rallied against the deal outside their informational meeting September 27. Majorities also voted no in Locals 7 (Jefferson North Assembly, Detroit), 685 (four transmission plants in Indiana), 869 (Warren Stamping, Detroit area), 1248 (Mopar in Center Line, Michigan), 1264 (Sterling Stamping, Michigan), 1286 (Belvidere Assembly, Indiana), 1166 (Kokomo Casting, Indiana), 372 (Trenton Engine, Michigan), 1435 (Toledo Machining, Ohio), 1700 (Sterling Heights Assembly, Michigan), and others. Just a few locals, mostly small, saw majorities vote yes. “I feel like the people who hire in at the lower wage deserve the chance to get to where I’m at, to be able to live in a comfortable manner,” said Nancy Collins, a team leader at Kokomo Transmission in Indiana. When she started at Chrysler 20 years ago, she was a single mom supporting three young kids. Today her daughter and son-in-law, with three kids of their own, work at the plant too. In this year’s Big 3 bargaining, UAW officers had pledged to “bridge the gap” between the tiers. But the union’s choice to settle with Chrysler first—when General Motors and Ford are richer targets, with fewer second-tier workers—seemed aimed at lowering members’ expectations. 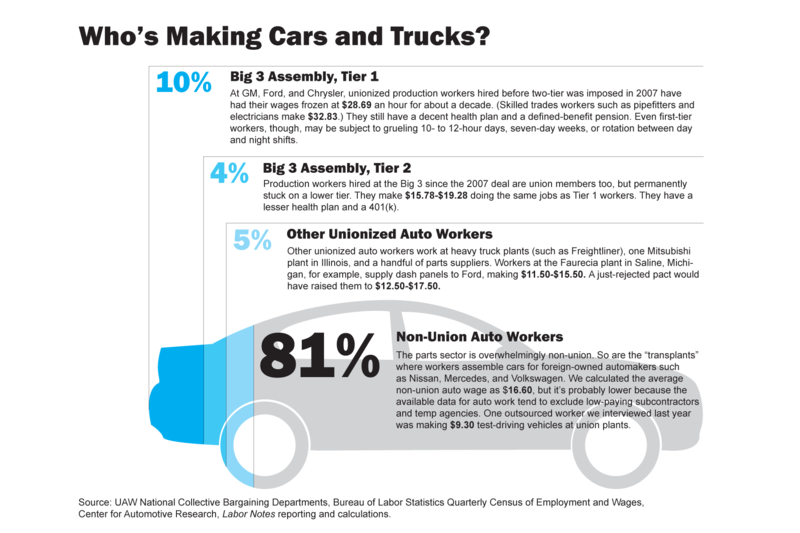 Non-union workers make up 81 percent of the U.S. auto workforce. Tiered contracts are worsening the union jobs that remain. “This job that built the middle class, now it’s going to build the poor working class,” said Asar Amen-Ra, a 20-year Mopar employee in Center Line, Michigan. Graphic: Sonia Singh. The second tier, earning $15.78-$19.28 an hour, now comprises about 45 percent of the company’s workforce. Meanwhile Tier 1 workers—those hired before 2007—have been frozen at $28 for years. CEO Sergio Marchionne has made no secret of his desire to phase out the top tier altogether. “This job that built the middle class, now it’s going to build the poor working class,” said Asar Amen-Ra, a 20-year Mopar employee in Center Line, Michigan. The lower tier wasn’t supposed to balloon forever. “When we were hired, the company was just starting to turn around,” said Denny Crum, a forklift driver in Toledo who started two years ago. Meanwhile, the automakers have certainly bounced back, even Chrysler. The company’s latest figures, for the second quarter of this year, showed $1.4 billion in profit in North America, a robust profit margin of 7.7 percent. In the same quarter Ford pocketed 11.1 percent and GM 10 percent. Marchionne himself took home a handsome $72 million last year. Assuming a 40-hour week, that comes to $34,615 an hour. Many members are especially angry that the union and Chrysler abandoned a longstanding promise to move a segment of Tier 2 workers up into Tier 1. The 2009 settlement agreement and 2011 contract summary reiterated that the lower tier would be capped at no more than 25 percent of the workforce as soon as the contract expired in September 2015. That means nearly half of Chrysler’s second-tier workers were supposed to move up to $28 this month. They had waited years for this raise. Instead, under the proposed deal they would be stuck in Tier 2 for good, earning $17-$24 at first, and eventually topping out at $25.35. Workers say union officers’ excuse is that the promise was only in the contract summary prepared by the union, not in the actual contract. “Doing the same work, side by side with somebody that makes $10 more, is not okay with me,” said Alex Smith, who works for Mopar, Chrysler’s parts distribution unit, in Los Angeles. In his plant, one worker printed up T-shirts reading “Solidarity, No More Tiers, Vote No!” Many wore them to work the day before their vote. Managers “said it was going to pass anyway and we were wasting our time,” Smith said. But the next day, Local 230 became one of the first to vote the settlement down. Another in the first wave of no votes was Local 1248, which represents Mopar’s headquarters facility in Center Line. Adding insult to injury, someone discovered a provision—buried on page 255 of the 456-page tentative agreement—that would create new subdivisions within Tier 2, with axle workers topping out at $22.35 and Mopar workers at just $22. The union’s breezy official “contract summary” hadn’t mentioned the lower wage scale for Mopar. But members made copies of that page, posting them up in the cafeteria and handing them out at the plant gates. Another buried provision (pages 265-270) would create a still-lower tier of temporary workers. The old contract allows temporary part-timers to replace absent workers only on Mondays, Fridays, weekends, and holidays. Now temporary workers could be full-time, work any day of the week, and be used in a range of situations besides absences. Current temps would be grandparented into a wage scale of $17-$22. Newly hired temps—an even lower tier—would make just $15.78-$19.28. Meanwhile Tier 1 workers, who’ve gone a decade without a raise, would only get 3 percent raises in the first and third years of the four-year contract, and 4 percent lump sums the other years. The deal wouldn’t restore inflation-based cost-of-living raises for them, or for retirees on pensions. Second-tier workers from Detroit’s huge Jefferson North Assembly Plant led an impromptu vote-no rally September 23 outside the union’s international headquarters. Photo: Judy Wraight. About 30 people, mostly second-tier workers from Detroit’s huge Jefferson North Assembly Plant, held an impromptu vote-no rally September 23 outside the union’s international headquarters. Besides the tiers, members were angry that the deal would worsen an already draconian attendance policy. “That was one of our major complaints, to fix it—and they made it worse somehow,” said Blake Williams, a five-year employee who drives a forklift. Employees say the company doesn’t excuse absences or tardies for things outside their control—traffic accidents, construction, weather, a sick child. You have to have a doctor’s note, and even then it’s hit or miss. For instance, Chrysler wouldn’t accept Williams’ excuse note from the emergency room when he took his twin babies, both running high fevers, to the hospital. Under the old contract, seven occurrences in a year would get you fired. The tentative agreement would separate tardies from absences, but just three in a year would be punished with a one-day layoff; the fourth tardy, a five-day layoff; the fifth tardy, a 30-day layoff; the sixth tardy, firing. Workers took it into their own hands to pass the word about the deal’s lowlights. Williams and a few co-workers read the whole contract and spread the details as quickly and widely as they could. Their idea wasn’t to push a no vote, just to “tell everything you know, good or bad, so everybody can make an informed decision.” Local 7’s production workers rejected the deal with 66 percent voting no, and skilled trades with 77 percent. Pamela Pate works on the door line. She’s put in 16 years on Chrysler’s assembly lines in three different plants, and moved twice for the company. On top of the other problems with the deal, she was frustrated it wouldn’t restore the seniority she and others lost when their previous plant closed. She came to Jefferson North in 2011, making her less senior than the influx of 2010 hires. “I’ve got a decent job for now. I’m 44 and I still feel like I’m young and I’m able to do it,” she said, “but I’ve got another 13 years to go before I retire.” She had hoped one day to bid into a less physically grueling job in the body shop or paint shop. Now that looks impossible. The agreement’s sweeteners are a $3,000 signing bonus for everyone and a profit-sharing formula that’s somewhat more generous for the second tier. But it’s unlikely the profit-sharing payouts would turn out as high as the appealing sums mentioned in the contract summary, Williams pointed out—since those depend on the company hitting “almost unattainable” financial targets. The deal would do little to alleviate the unpopular Alternative Work Schedule, which has forced members at affected plants onto four-day weeks of 10-hour shifts. Two-thirds work every Saturday, and one-third flip between day and evening shifts every week. Those who regularly work Saturdays would now get time-and-a-quarter pay, but no relief from the grueling schedule. The language on health care is vague. Chrysler and the union agreed to create a co-op with Ford and GM to pool employees’ health care expenses, with details to be worked out later, and to weaken benefits if necessary to avoid the Affordable Care Act’s looming Cadillac tax. “Why would I vote for something that I have no details on?” Amen-Ra asked. Revealed at the same time as the contract settlement was a plan to move products around so that all Chrysler’s small cars will be made in Mexico and its trucks and SUVs in the U.S.
After the first wave of no votes, Parker predicted that union officers would ramp up the pressure on workers in the remaining locals to vote yes. “I’m quite sure they’ll spend Monday telling my plant that the 200 [a midsize car currently made in Sterling Heights] going to Mexico is a done deal, but whether the truck stays here, that depends how you vote on the contract,” he said days before Local 1700’s vote. Instead, he argued, “they need to negotiate a bigger pie.” His local stood up to the heat: 72 percent voted no in production and 65 percent in skilled trades. What now? One possible outcome is for the union to put the Chrysler deal on hold while it bargains with Ford and General Motors. When Ford workers voted down their contract in 2009, it stuck. 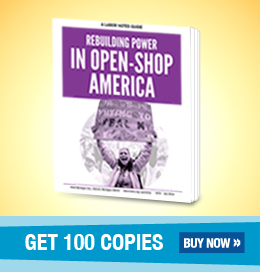 When Chrysler’s skilled trades workers voted down theirs in 2011, then-UAW President Bob King declared it ratified anyway by lumping together skilled trades and production. The union’s Chrysler council, made up of elected leaders from each local, is meeting today in Detroit to regroup. Meanwhile the union has announced that Ford workers may go on strike October 4 at the Kansas City Assembly Plant (Local 249, Missouri), which makes the bestselling F-150 pickup truck. Ford has responded by cancelling production shifts for October 2-4 at the Kansas City plant, and scheduling maximum mandatory overtime at its Dearborn Truck Plant. A letter distributed to employees in Dearborn said the union’s Ford Department had advised the local that the company had a contractual right to do this. CORRECTION: The original version of this article mistakenly identified the union at Kokomo Casting Plant as UAW Local 1102. Production workers there, who voted down the deal, are represented by Local 1166. In a separate Local 1302, which represents salaried workers there, a majority voted yes.